¡Dígame! is now available on Amazon. ¡Dígame! 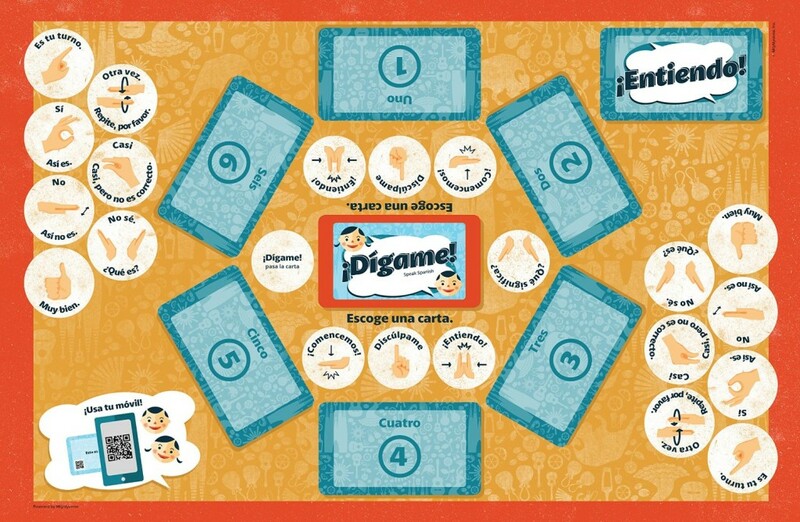 gameboard has illustrations of gestures and phrases that help you play, as well as spots for the cards. You may be asking yourself, “Why are the Mightyverse developers spending time on card games when they could be writing software?” or “Have they pivoted to become a board game company?” Good questions, that we’ve wrestled with ourselves. The answer lies in the fundamental goals of our company and our lean startup approach. The origin of the card game was a paper prototype for our mobile app. To learn to speak a language, we must actually speak the language. But how do you speak the language if you don’t already know it? Language learning research supports that people learn best in an immersive language learning environment, learning grammar and vocabulary by inferring patterns from the language we hear. One of the biggest hurdles that we face as new language learners is to be brave enough to start speaking when we know very little and may feel uncertain about the true meaning of the words we speak. This is a huge barrier for most new language learners to overcome. ¡Dígame! came out of wrestling with that challenge for language learning gameplay. We realized that we could accomplish rapid iterations of the card game much faster than software and that would speed up our design process. Over the past year, we have held dozens of play test sessions with groups of friends, strangers, classrooms and families at all levels of learning, from near-fluent to people with no prior knowledge of the language. We designed the game to reflect the language learning model that we believe is the most powerful and efficient way to learn a language. Each of the phrase cards in the game is linked to a Mightyverse phrase video with a QR code. We have analytics in place to see how and where those phrases are accessed. With the first game complete after a considerable effort, it will be much simpler to create variations across different language pairings. We have InDesign templates with scripts to automate creation of the playing cards so that the production of the game can be scaled more easily across other languages. We are quite far along on a Japanese learning game for English speakers and an English learning game for Japanese speakers that we have already started play testing. We’re also hard at work building our mobile app that allows native speakers to record phrases and share them with language learners. It is exciting to feel how our momentum has increased with everything we have learned over the past year, working with our growing community of speakers and learners. We’ve had a lot of fun developing the game from it’s initial sketches to a full fledged product. It’s been extremely gratifying to see how much fun people have with it while learning languages. This entry was posted in Uncategorized on January 18, 2015 by sarah.